Back again, and let me tell you, tendinitis is no joke. So of course, although I’ve cheated a little and used the keyboard here and there, editing photos, typing up recipes, and responding to your comments over this past month has been out of the question. I’m sorry I was gone so long, though! Before you get all worried on my behalf, I’m not actually typing this – I’m dictating it using voice recognition software. It’s frustrating sometimes, but I am slowly getting used to it and I don’t know what I would do without it. A month ago, though, back when I was in denial and still typing/cooking through the pain, I made you these blueberry crisps! And they were so, so good. But yes, I can sense what you’re about to tell me, and you’re right: I definitely shouldn’t have done that. I should have been resting my arms, icing them with a bag of frozen peas, and watching food documentaries on Netflix. Now I know better. At least I had the good sense to choose a fruit to crisp-ify that wouldn’t require any chopping. 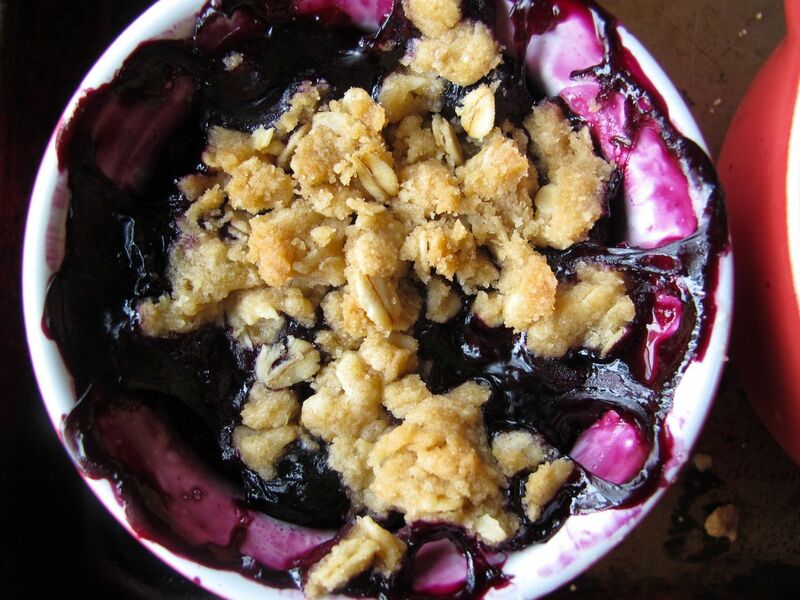 Blueberry (or blackberry) crisp is up there with the easiest and most delicious of all summer desserts. 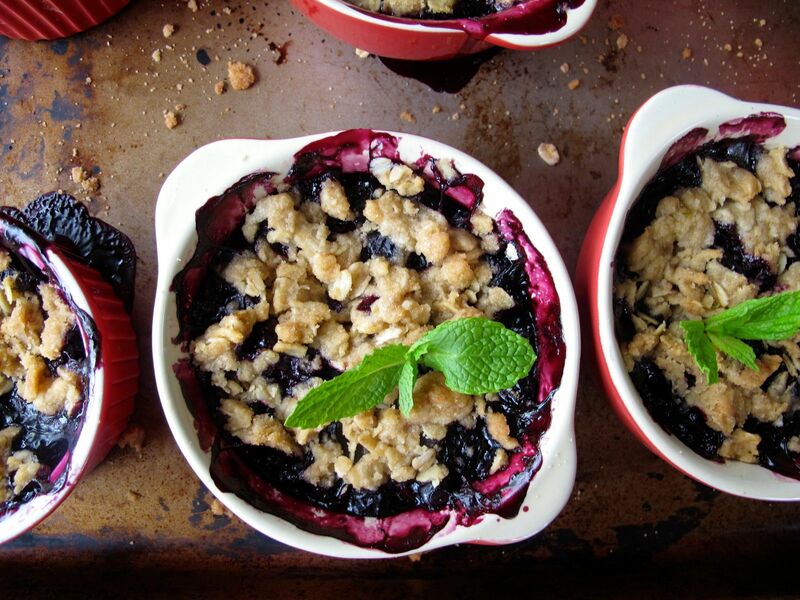 The seasonal berries are already perfectly bite-sized, so the only thing that’s left for a hungry baker to do is to create a crumbly topping and stick it all in the oven. 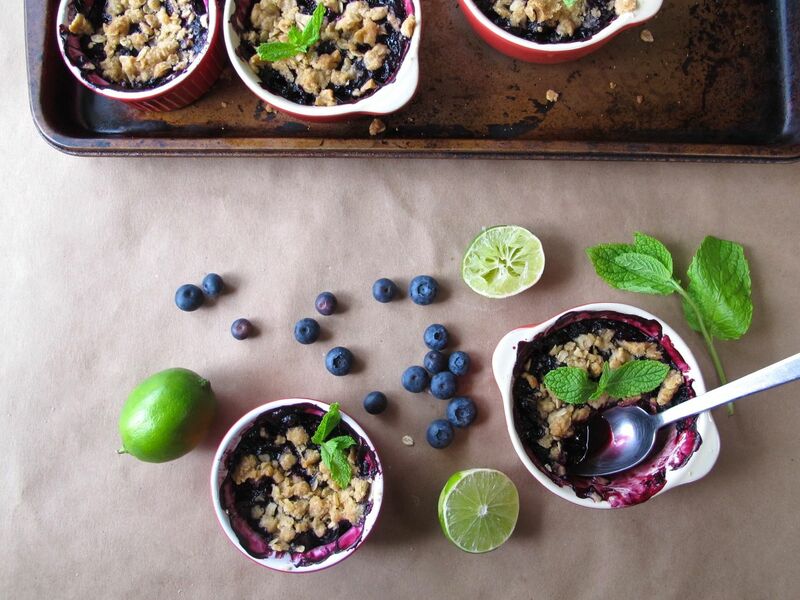 I couldn’t help but make it a tiny bit more complicated than that, adding fresh mint sugar, fresh lime juice, and lime zest to the blueberries before I sprinkled them with their topping. 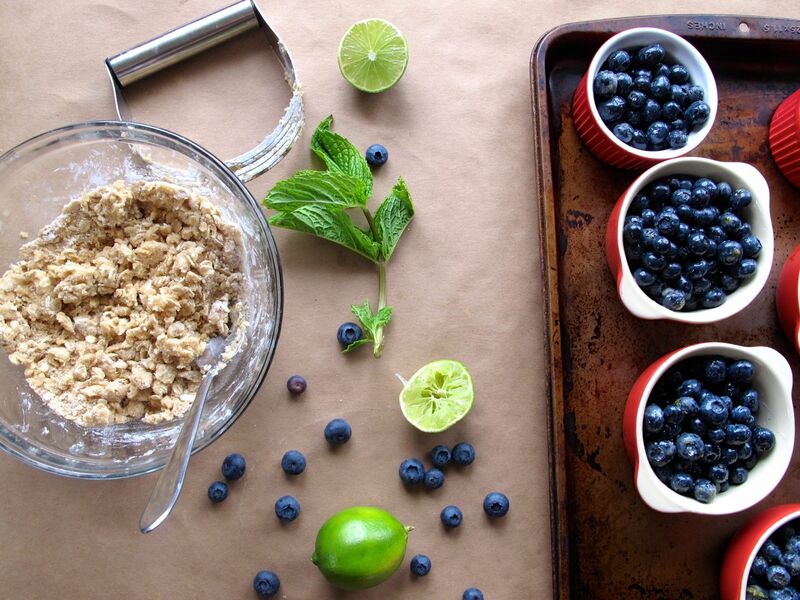 I guess I was imagining it to be a baked dessert version of a blueberry mojito. 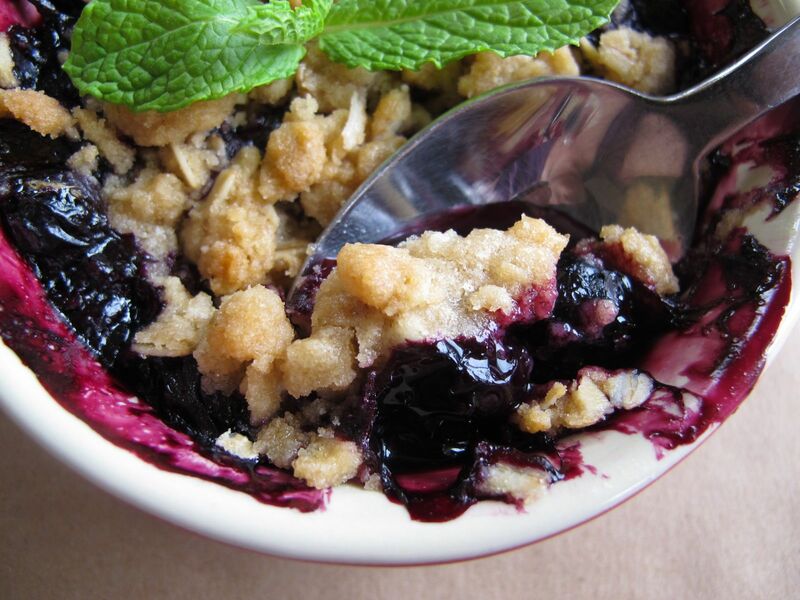 The fresh mint perks up the blueberries and the tart lime juice keeps the crumble from becoming too sweet – in my humble opinion, blueberry and lime is just as nice of a combination as blueberry and lemon (if not a nicer one!). I also baked the crisps into individual ramekins, which makes them the perfect size to sneak one at a time for yourself out of the fridge. The following week, though, I had Paula re-create it in a large baking dish, and that worked fine too, with only five minutes extra baking time. I have a few more already-photographed recipes to share with you, too, so I hope I can get back to posting on Thursdays as usual now, but the photos are tricky to insert and manage using the speech recognition software, so that means still using the keyboard and mouse a little with my hands. In fact, it was probably a combination of all the dragging around of photos that I did with my mouse, paired with my dissertation, that made my tendinitis so bad. If anyone has any advice for photo managing shortcuts, it would be much appreciated. I also might still be slow to respond to your comments, since I’m trying to spend as little time as possible in front of the computer screen so that I can avoid the temptation to use the keyboard altogether (and meanwhile, I still have plenty of food documentaries on Netflix to catch up on…). Active time: 15 min. ; Total time: 55 minutes. 1. Pre-heat the oven to 350°. 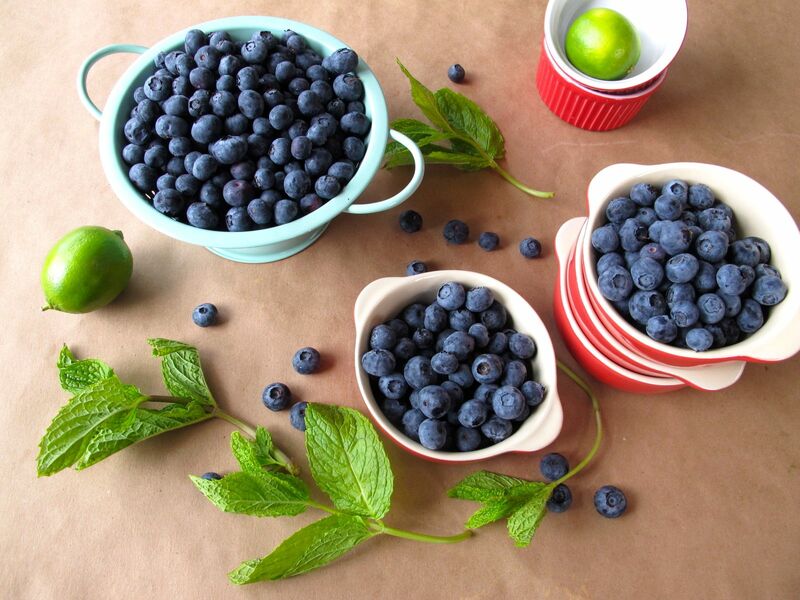 Rinse berries and place them in a bowl. 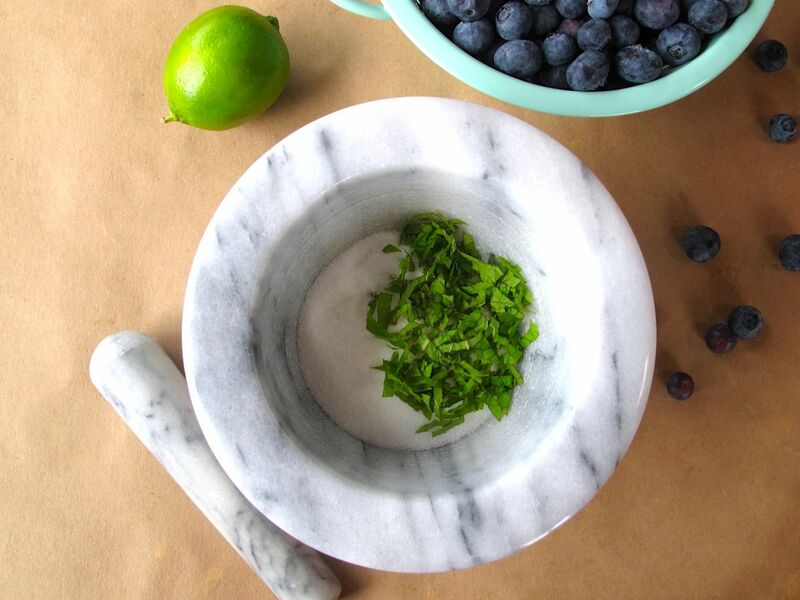 Tear or chiffonade mint leaves and use a mortar and pestle to grind the fresh mint, and the lime zest if using, into the sugar. 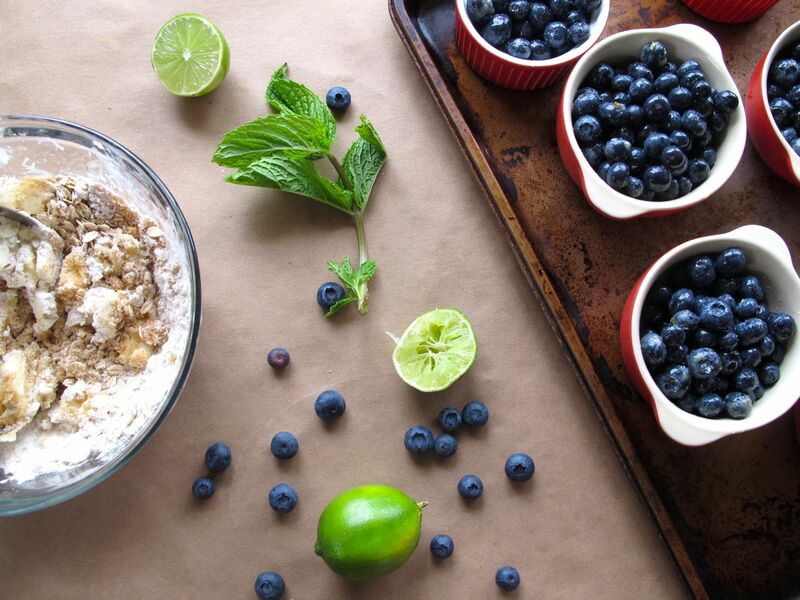 Sprinkle the mint sugar over the berries, add the cornstarch and fresh lime juice, and gently mix. 2. 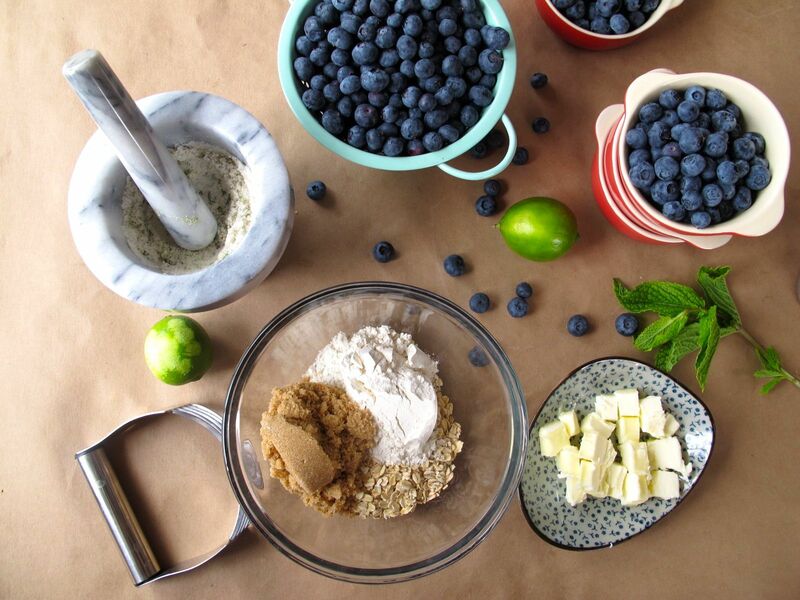 Once the butter has softened, combine the oats, flour, brown sugar, and salt (and additional lime zest, if using) in a medium bowl and use a pastry cutter (or your fingers) to cut the butter into the other ingredients and to mix them all together well. 3. 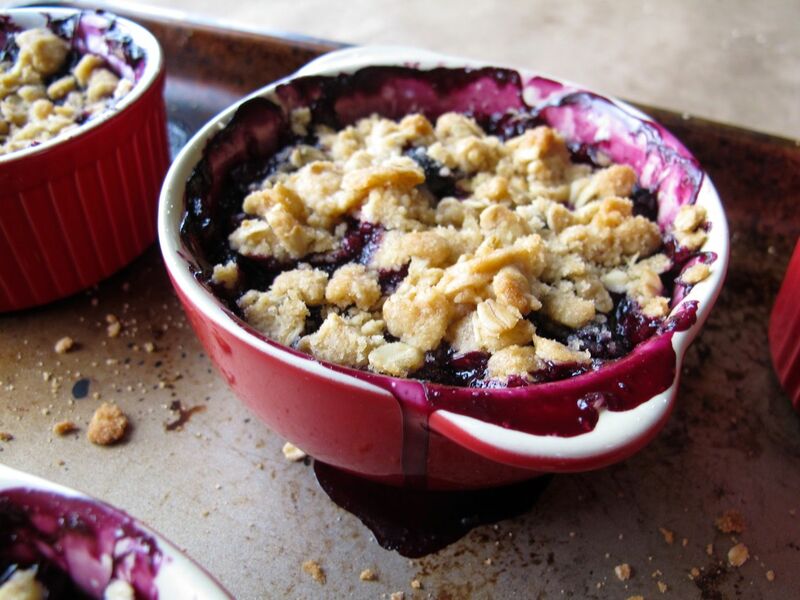 Pour the berry mixture into individual ramekins (or into an 8-inch square baking dish), then use your hands to pinch together the topping as you crumble it over the fruit. 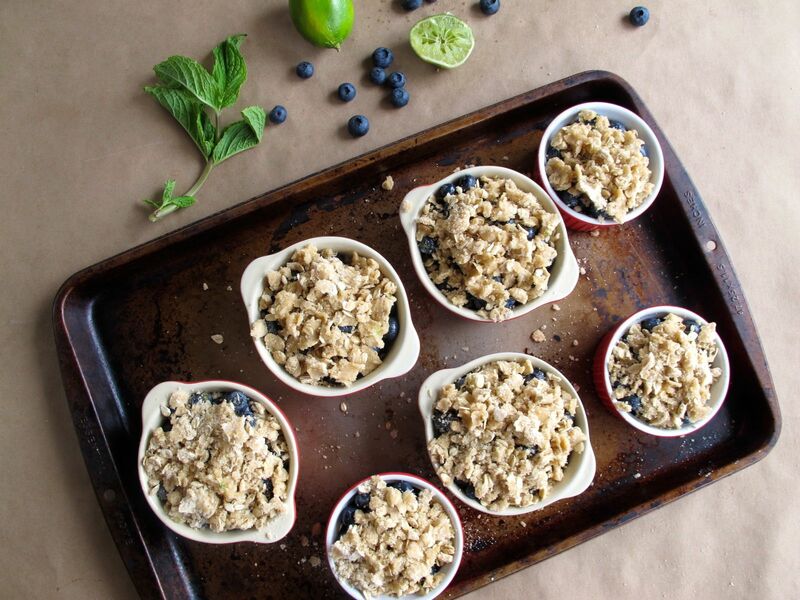 Assemble the ramekins on a baking sheet, to easily get them in and out of the oven. 4. 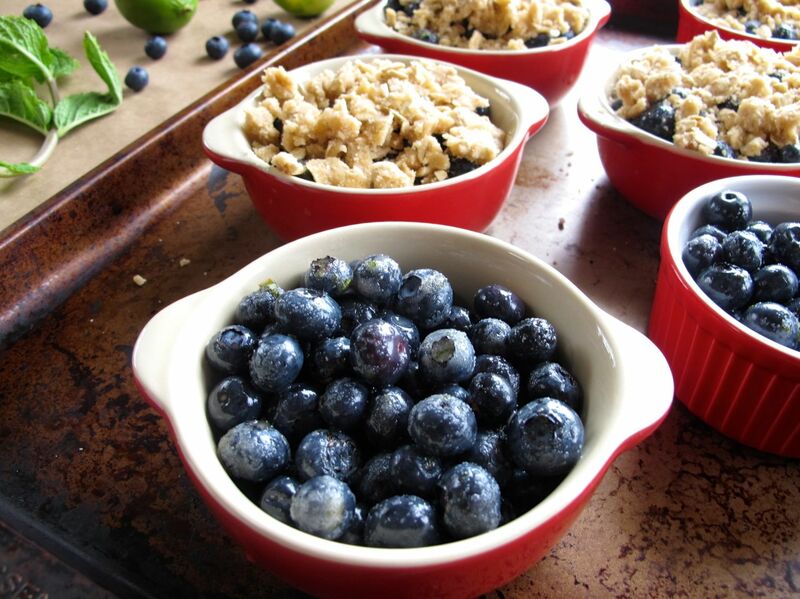 Bake for around 35 minutes for ramekins, or around 40 minutes if using a large baking dish, until blueberries are bubbling. Allow to cool completely so that the berries can gel more, or enjoy it while it’s still warm, although it might still be pretty juicy. Once cooled, cover and refrigerate for up to several days. Reheat in the oven, or serve cold or at room temperature, with ice cream, or not. 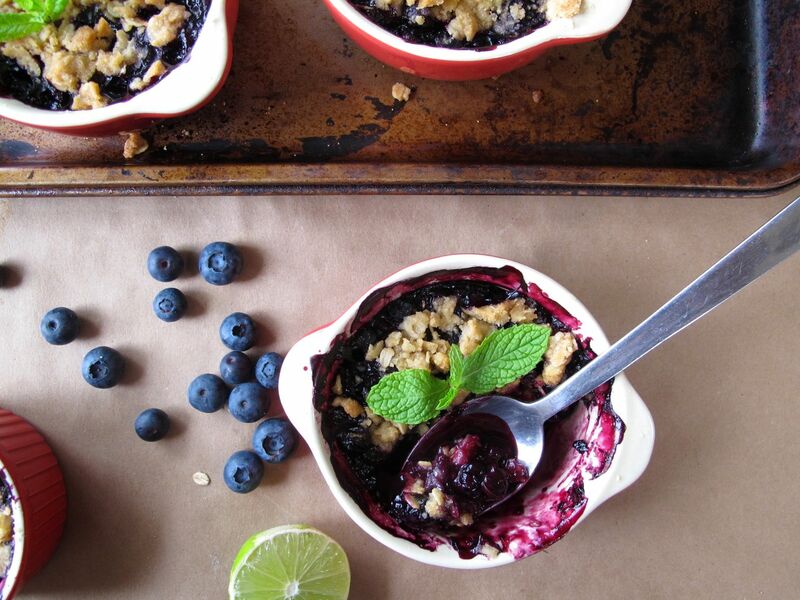 Glad you’re feeling better, these blueberry crisps look delicious! Thank you! Yes, I’m not quite fully recovered but I’m getting there… the resting & icing are helping. Getting to snack on blueberry crisps helped, too! I hope you’re getting better – I used to suffer quite badly when I had a lot to write, and I still get it at times. It’s incredibly painful and annoying! Have you tried Alexander technique? Some musician friends I know swear by it. Thanks! I’m sorry to hear that you suffer from tendinitis too — I agree that it’s both painful and annoying! Never heard of the Alexander technique, but I’ll look it up! Beautiful and delicious. So perfectly seasonal. Just stunning. I love the addition of mint here. Feel better! You poor thing! Having an injury of sorts makes you realize just how capable you normally are. Well-done with the dictation! Thanks, Amanda! I know — it’s really made me realize how much I take for granted (and how many things I use my hands for, and how much I rely on my computer/smart phone for everything…). I’m just going to need to be increasingly mindful of all of those things if I want any hope of a sustainable recovery. Hope you’re feeling better! 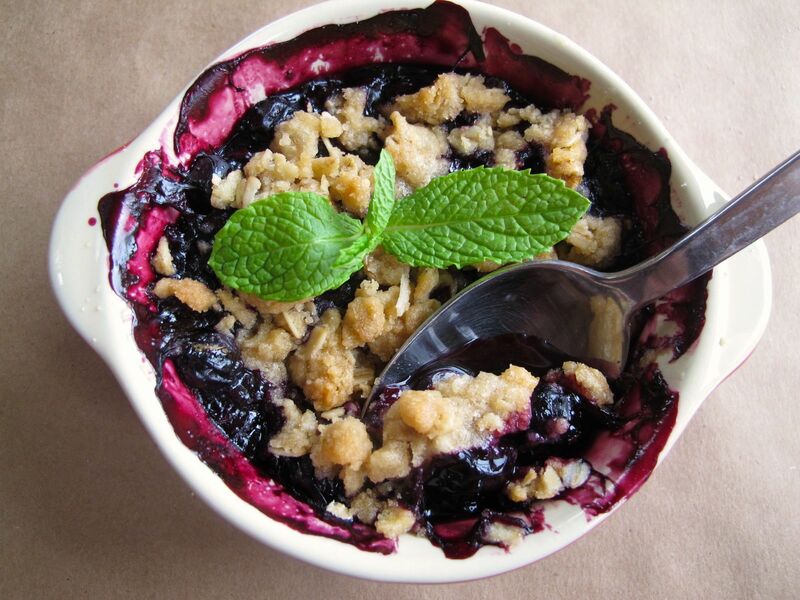 I’ve had tendonitis as well and it’s really terrible how long it takes to go away… love that we’re in blueberry season! Thank you! Yes, I know, it seems crazy how long it is taking me to get better… but my physical therapist reminded me that this is an injury 10-15 years in the making, so of course it might take more than a month to heal. 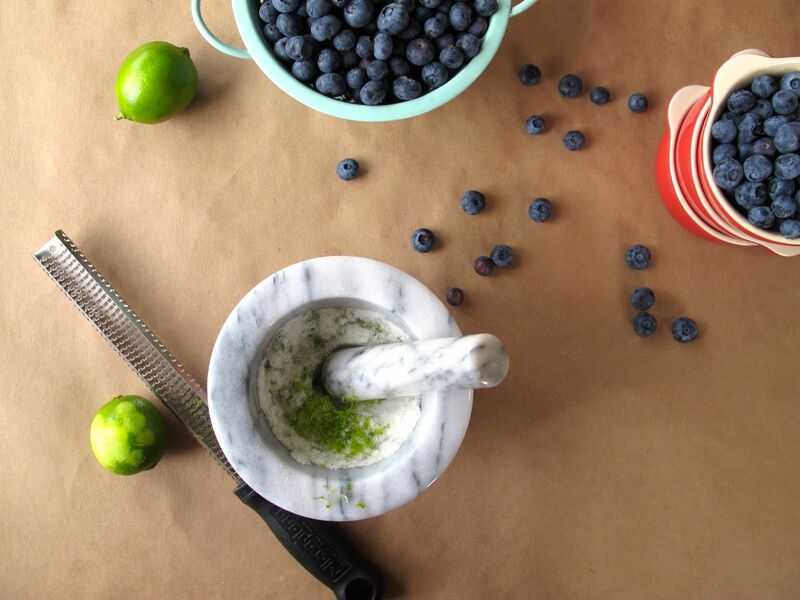 Blueberries are such a good summertime fruit, and pairing then with mint and lime sounds very good. Hope your hands feel better soon! Thanks so much! Yes, I love the blueberry-mint combination. 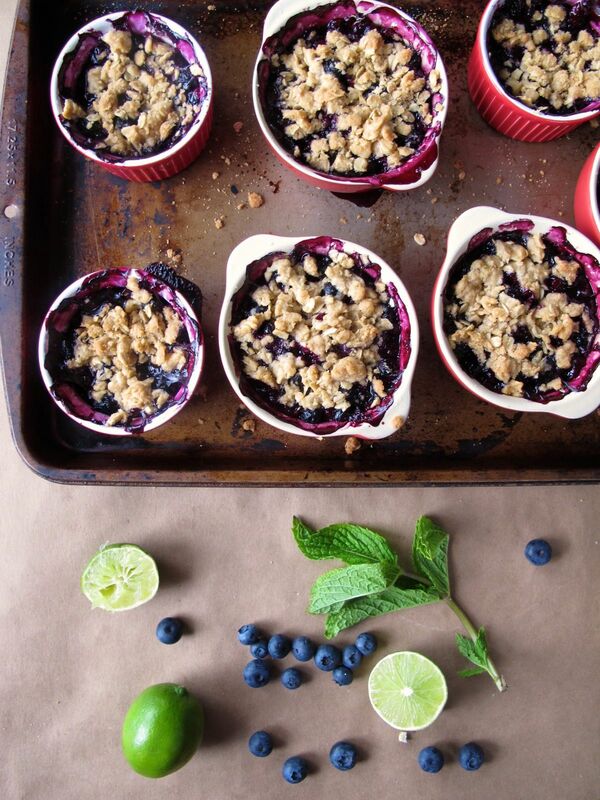 I think blueberries would go nicely with a lot of other fresh herbs too actually… especially maybe basil? This looks amazing! I feel your pain. I have tendonitis in my shoulders down the arms and hands. Of course the doctor says to rest but it’s impossible so it’s chronic. Which makes knitting a tough go! Thank you! Oh no, I’m sorry to hear about your tendonitis. Mine sometimes goes up to my shoulder on my right side… and yes, my physical therapist says to rest, but complete rest is impossible! (My current goal, though, is just to make it out of the inflammation stage and into the chronic stage.) Sorry to hear that it makes knitting tough for you, too! Luckily Paula is more of a knitter than I am, but I know she would really miss it if she couldn’t knit. Thank you! I know, I am a sucker for cute, individual serving-size desserts, and it’s actually extra nice to serve/eat crisps this way, since they tend to be kind of messy and not so picturesque when dished out of a big serving dish, but they look much more appetizing and fancy in ramekins! This crisp looks AMAZING! I love the mint-lime spin on it. Yowch – that can’t be fun to have such bad tendinitis…I’ve had it on my foot, but that doesn’t seem anywhere near as restrictive. I hope you’re on the mend! And happy belated blogiversary! oooh, tendinitis IS no joke, allison: rest up! I tend to employ the same “ignore/push through it/it will go away right?” method when i have back pain, but it never actually works as much as a little R&R does. These are the perfect summer thing: you have to love summer for the fruit crisps, yes? and i love the mint in there: it’s a nice way to get an little bit different flavor than straight-up blueberry, for sure. And last but not least, HAPPY BLOGIVERSARY! 3 years means we’re the same “age” – i turn 3 this month, so we’re only one month apart. :) Quite an accomplishment, you. One of my dearest friends has a blueberry farm, so our freezer is always full and ready for dessert-making! 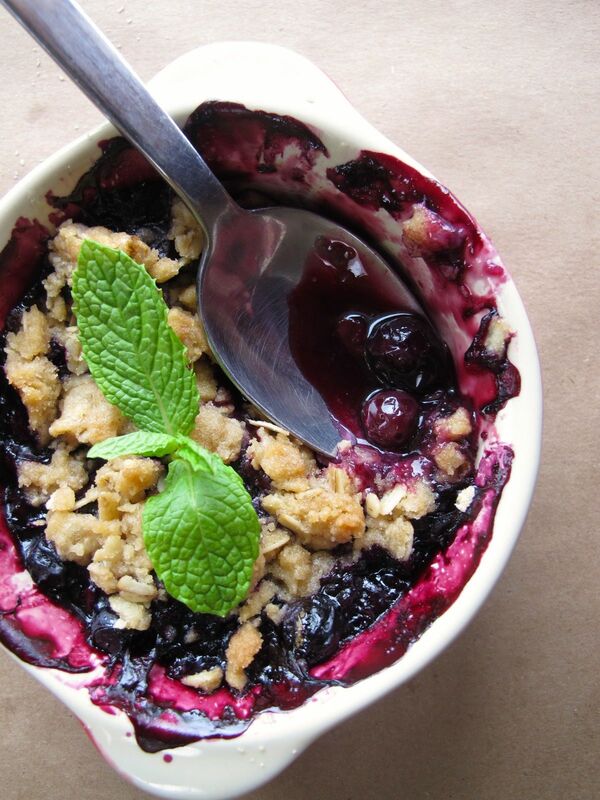 I’ve gotta try adding mint to a blueberry treat. Why haven’t I done that?!?! As usual, such a gorgeous photo spread. And your recipe ain’t too shabby either! Looks delicious, love blueberry crisps! Ow – hope you are feeling much better soon. Pain is exhausting. And poor Paula – doing all the dishes. Love the individual blueberry crisps – just beautiful. Yum! Anything “crisp” I love! Can’t wait to try these! These remind me of my pies-in-a-jar I love to make! Also, I enjoy the name “spontaneous tomato” a lot. Hope you feel better soon, I can’t imagine what is would be like to not be able to use my hands as much, anyway love this crisp!!! love delicious! This looks soooooo delicious!!! I love the flavor combinations here!